$4.49 For Wizard of Oz (Two-Disc 70th Anniversary Edition) on Amazon.com | A Savings WOW! 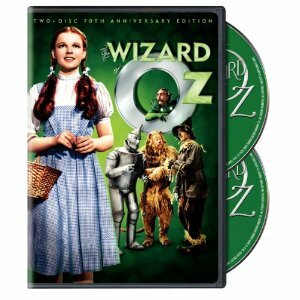 Amazon.com has The Wizard of Oz (Two-Disc DVD 70th Anniversary Edition) for only $4.49 right now. It is eligible for free Super Saver Shipping if you have an order of $25 or more. This would make a great stocking stuffer. As with any Amazon.com deal, prices and availability can change at any time, so if you want this deal at this price, you should buy it now before it changes. Get The Wizard of Oz (Two-Disc DVD 70th Anniversary Edition) for only $4.49 on Amazon.com. That’s a great price. This is one of my favorite movies, the message is timeless. The story never gets old!